New York – August 6, 2018: UNESCO has designated a series of sites associated with the checkered history of Christians in 16th- to 19th-century Japan as the country’s 18th World Cultural Heritage Site. 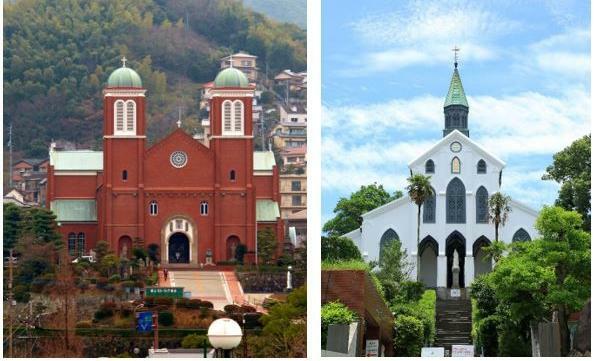 The “site” is comprised of 10 villages in northwest Kyushu, as well as the ruins of Hara Castle – originally built by the Portuguese – and St. Mary’s Cathedral of the Immaculate Conception in the city of Nagasaki. Because the practice of Christianity was banned in Japan until 1873, Christians (known as Kakure Kirishitan) worshipped – and missionaries spread the gospel – in secret. It is the sites’ “secret” churches in remote seacoast “Christian” villages and isolated islands that are the main component of UNESCO’s recognition. The ruins of Hara Castle are another element, as it was used by Portuguese and Dutch missionaries.One of the most visible examples of UNESCO’s designation is Nagasaki’s Roman Catholic St. Mary’s Cathedral – also known as the Cathedral of the Immaculate Conception – built in 1914 after the ban on Christianity was lifted. The original cathedral was destroyed by the atomic bomb that fell on Nagasaki in August 1945 and a replica of the original was consecrated in 1959. Statues and artifacts damaged in the bombing, including a French Angelus bell, are now displayed on the grounds (and at the Cathedral of the Immaculate Conception). The nearby Peace Park contains remnants of the original cathedral’s walls. Oura Church is another Catholic church in Nagasaki. Built towards the end of the Edo Period in 1864 by a French missionary for the growing community of foreign merchants in the city, it is considered the oldest standing Christian church in Japan and one of the country’s greatest national treasures. To know more, visit: http://kirishitan.jp/en.